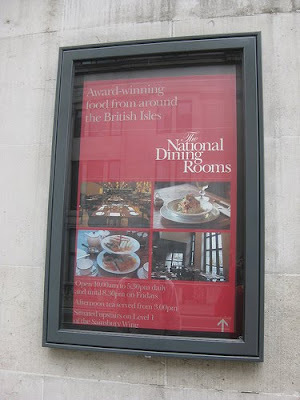 As regular readers may have noticed, your author has a bit of a thing for museum cafes and restaurants, and he has been to the National Dining Rooms, at the National Gallery, on a couple of very pleasant lunchtimes. Its probably more to do with a love of museums and galleries than a never-ending search for the best restaurant in London, but it is nice nonetheless. A branch of Peyton and Byrne, it is overseen by prize-winning executive chef, Simon Duff, who originally trained under Marco Pierre White, and has worked at a number of London venues including the Franklin hotel and the Swissôtel the Howard. It's a little pricey, especially if you're drinking, but on the right menu £23 will buy you two courses, and when you consider that you get some of the best paintings in the world thrown in for free, it doesn't seem so bad.